For full graphical presentation, please use a v5 or later browser. Seventeen years ago in Australia I discovered the poetry of Robert Adamson in a Selected Poems published by Angus & Robertson in the mid 70s. I had been studying Australian poets for my final exams and it was with excitement and wonder that I read these poems from a poet who not only spoke in a voice that was modern and familiar, but also one that defied categorisation, being imagistically rich, informed, dangerous, streetwise and literary. His poetry undoubtedly had a “mystical” quality, but not in any saccharine sense of the word. Rather, it called on the reader to participate in the discovery of the poetic, in the uncertainty — the terror and the beauty — of metaphor, of language metamorphosising into something that works in its own terms. In other words, the poem gaining a life of its own. It didn’t surprise me to find that Adamson’s great obsessions were Shelley, Mallarmé, and the American poet Robert Duncan, who each, in their own ways, explored the ur-text of the Word, the sublime of the poem. So vital was the stuff of an Adamson poem, so energetic the “calling” of his poetic, that I found myself on the Perth-Sydney Greyhound bus, crossing the Nullarbor Plain in search of this intense and unique voice. I say voice specifically, as I had no idea what the person “Robert Adamson” was like, and knew nothing of his personal life other than what I could draw from the poems — and as any reader knows, you don’t fuse personae and authors! So maybe I was in search for a “source” of a “poetry”, more than anything else. I eventually found Robert, in Balmain, operating at would could only be called “full throttle”. The chemistry was explosive — we talked of Dransfield, Shelley, Duncan, Rimbaud, Mallarmé, and dozens of other poets. We raved for days without sleep. And, on this level, nothing much has changed — pursuing an idea or image until it has been “rendered” into poetry. From that first meeting Robert and I have maintained a friendship and have discussed poetry and poetics, with a similar intensity across varying distances! It was through Robert I met Juno Gemes. With Juno a similar chemistry developed. As soon as I saw the photographs from Juno’s “Under Another Sky” exhibition and heard of her support for Koori and other indigenous people’s Land Rights campaigns, I knew this was someone whose work I would have to examine closely. Juno’s photos have inspired me to write not only criticism but also poems and chunks of “experimental” prose. What didn’t surprise me was that Juno and Robert should work together. I had the good fortune to review their “juxtapositions” in Robert’s award-winning and iconic volume of poetry The Clean Dark. In some senses, this book gave a clue as to what was to come. The poetic spirit I found in each of them I found intensified when they worked together. 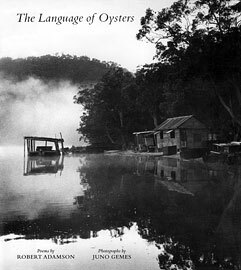 The Language of Oysters is testament to both a unified vision and the uniqueness of two artists reacting too and through the medium of place. The works, while remaining independent of each other “speak” to one another. This is what makes this book absolutely unique. The authorial integrity of each artist is respected, and yet there is almost a third artist present — a language of image and text that is conjured out of juxtaposition, out of a recognition of a way, or ways, of seeing. Above and beyond all else this is a book of great warmth. Rather than merely exploring a sense of place, it reveres it. And this attitude is exemplified by the wonderful production values Craftsman House have pursued in what can only be called an artefact. Adamson and Gemes are of the Hawkesbury River, a place rich in lore of Koori and post-Settlement cultures. Personally, it serves as the coda to the complex motives and needs that originally sent me in search of the poet Robert Adamson. That search was a search for place, a search for a voice in which I might share. This is a book that examines the boundaries and frames of belonging. It is constant declaration of wonder — and there is symmetry in this. This article reprinted from the John Kinsella website.